A morning with a little local mist rising from the fields around Billy greeted us. This soon burned off, though, and we were at last starting in T-shirts with the promise of a dry, calm, largely sunny day. Some mist could “hang around on some of the coastal fringes” but things were looking promising so we decided to retrace our steps across the local golf course, to Polzeath. From Polzeath, there was a headland to the north which we had either not seen before or, for part of it, seen only in some horrible weather conditions (slanting rain) on a previous Carol’s-camera-wrecking trip. As we made our way across the golf course dodging the occasional golf ball (FORE! ), we could see … yes, the bit of coast we were heading for was, indeed, one of the “coastal fringes” around which the mist “could hang”. 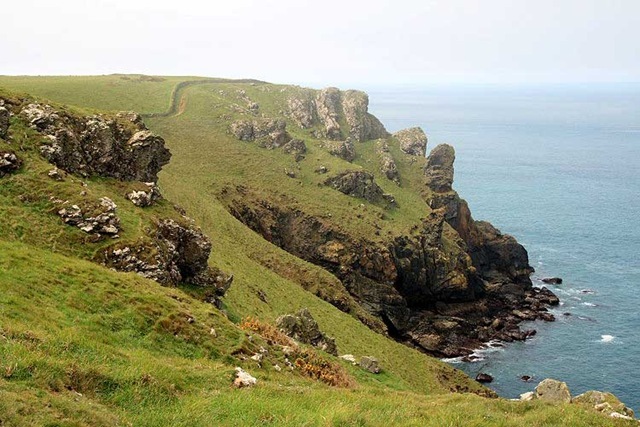 No matter, the day was splendid so we carried on undaunted and started the climb up to Pentire Point/Head. Pentire Thingy seems to be suffering from a slight identity crisis; it’s Pentire Head on the National Trust signs and Pentire Point on the Ordnance Survey map. Whatever it is, together with Rumps Point, it makes a spectacular piece of coast. 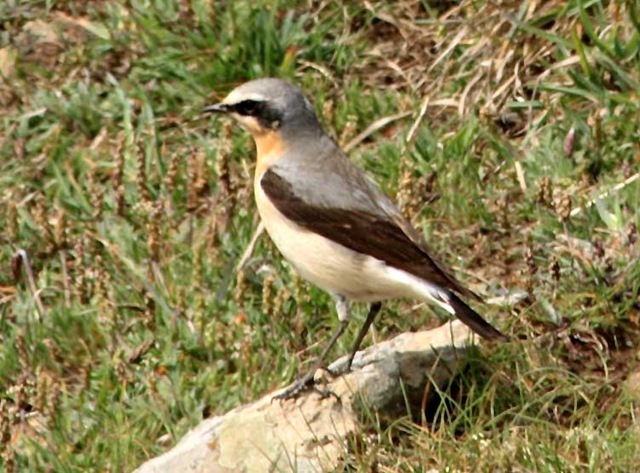 The wheatears we passed on the way up seemed to be enjoying it, too, and didn’t care what it was called. The thin veil of mist didn’t spoil our views or enjoyment but it did turn the cameras into something resembling excess baggage. We made it around the coast and then cut back across the headland to return once again via Polzeath. Inland was still sunny and the prospect of being able to cook outside (at last) was making us salivate. So, after dodging yet more golf balls (FORE!) on our return trip, we detoured an extra mile to call in to the local Spar for something to sling on George (our you-know-whose electric grill), sausages and pork steaks, together with the makings of a Greek salad. After a round trip of between nine and ten miles, the first beer went down exceptionally well and it was wonderful to take of our walking boots and pad around barefoot in the grass. The second beer was pretty good, too. We did cook outside but, once again, life clouded over and cooled down so we ate inside again. A wonderful day. “Fore!” is shouted as a warning during a golf game when it appears possible that a golf ball may hit other players or spectators. The mention of the term in an 1881 British Golf Museum indicates that the term was in use at least as early as that period. The term means “ahead”, and it is believed to come from the military “beware before”, which was shouted when a battery fired behind friendly troops. Other possible origins include the term being derived from the term “fore-caddy”, a caddy waiting down range from the golfer to find where the ball lands. These caddies were often warned about oncoming golf balls by a shout “fore!”. I hesitated long & hard over FOR and meant to look it up, but age got in the way of intentions. I cannot believe elrond spotted it, but can believe that he can’t spell.